Nestled away on the Northern end of Myrtle Beach sits this golden-era studio apartment. St. John's Inn is a 3-story motel complex that is home to thousands of vacationers each and every year! St. John's is situated directly across the street from the beach; approximately a 1/4 mile walk for our guests. Being on the North end of the beach, this area is not as crowded as Central Myrtle Beach. However, this unit is only an 8-minute drive to everything Myrtle Beach has to offer including the infamous Myrtle Beach Skywheel, Boardwalk, Broadway at the Beach, Ripley's Believe it or Not!, Top Golf, shopping, dining, and so much more! The unit itself is a small studio on the 2nd floor. Unit 204 is a perfect budget friendly getaway for 2 guests. This studio features 1 queen bed, sofa, TV, small kitchenette, bathroom, and private balcony. You can even catch a tiny glimpse of the ocean from the balcony! 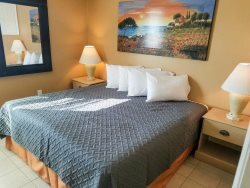 Upon your arrival, you will notice that the room has been cleaned and prepared for your stay. All towels, linens, and bedding will be provided. We hope our guests understand that this rental is a budget friendly accommodation. Our guests love having access to the amenities at the complex! These amenities include use of the outdoor pool and hot tub, vending machines, and laundromat.